Well I worked all weekend so I wasn't able to craft, so I will just be posting more garden pictures today. Now my work hours were severely cut, I only have 10 hours this week and only 4 hours next. Its great for having more time in my craft room and garden, but I sure will miss the money. I will just have to make more things to sell at the consignment store to make up for the loss of income. Today's pictures are of many different plants. 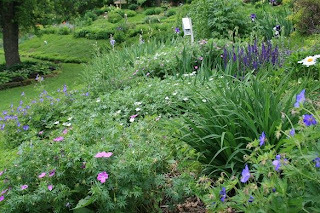 The first group of pictures are perennial Geraniums. I have many different colors and varieties of this treasured little plant. I love this plant because its so hardy, and even reseeds itself without being invasive. 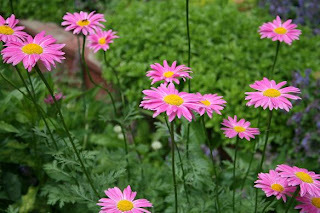 It will also bloom a second time in the season if you cut it back after blooming. 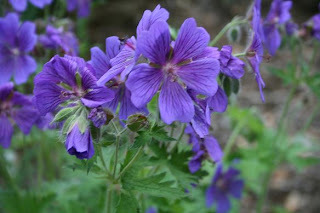 The first picture is a close-up of a purple geranium. 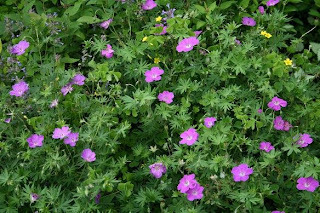 The second picture is a close-up of a pink Geranium and the third picture is a far away shot of my septic mound where most of my Geranium's are planted. They seem to enjoy growing on a sunny hillside. I also have white and blue geraniums. You can barely see the white ones in the picture below. 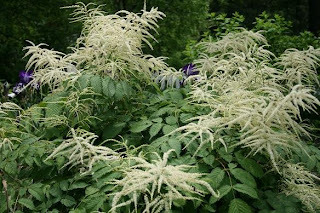 Here is a picture of my Goatsbeard. 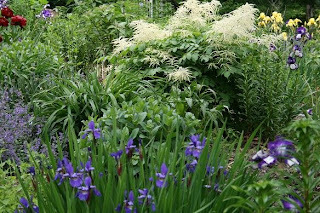 Its the white plume plant behind the Siberian Iris. It is absolutely gorgeous this year. 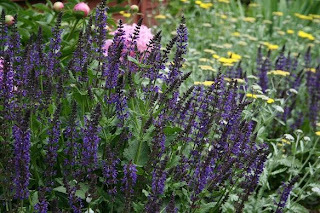 Below is a close up of some purple sage with yellow yarrow behind it. This pretty flower is an English Daisy. Don't you just love the color? Here is another close-up of my Goatsbeard. One of my favorite flowers is Lupine, but it is very difficult to grow in my area, so I'm always happy when I see a few blooms in the spring. I hear it grows 'wild' in some states...I wish that were the case here in Wisconsin. 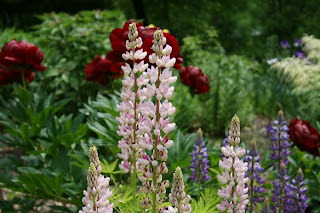 Behind the Lupine you can see the Red Peonies I featured in yesterday's post. 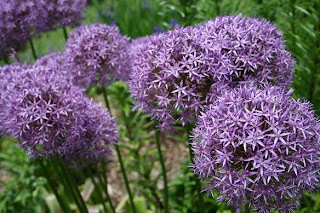 And finally here is a close-up of my Globe Alliums. Each globe is about the size of a small cantaloupe. It attracts bees and butterflies like you wouldn't believe, but they all flew away when I showed up to take the picture. I wish each and every one of you could see my garden in person just so you could smell it. The scent of the garden this year is unbelievable! The second you step out of my house or out of the car, you can smell the beautiful flowers. Its almost overwhelming. It smells like your inside a perfume company! Oh Wow ... looks at all these beautiful colors!! LOVE all the PURPLES ... I would be in purple heaven if I were at your house!! Your gardens are breath taking Amy! I can't say enough about them!! Absolutely gorgeous!! Were you expecting your hours to be reduced after grand opening hoopla was over?? Hang in there my friend! I hope your work hours get better for you soon! I just love flower pictures!! These are awesome especially the Alliums. I think summer is a tough season for craft stores because more people are outside doing stuff instead of inside crafting. I bet it will pick up in the fall once people start thinking about starting on the Christmas gifts they will make. Does your store offer classes yet? Maybe you could see if they would let you teach a cardmaking or stamping class. That way you can create more hours for yourself.